Mother: 25th Anniversary Edition aims to make Mother much more enjoyable for both Earthbound fans and those playing it for the first time. All enemy graphics, NPC sprites and tiles are be redrawn from scratch to be more faithful to the clay models. The goofy enemies are goofier and the creepy enemies are creepier. A shiny new font and title screen was added, too! 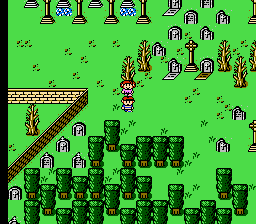 The overworld has been tweaked to be much less bleak and repetitive, so it’s harder to get lost. There is more scenery, areas are more colorful and confusing areas like Duncan’s factory have been simplified. On the other hand, tiny areas like the Cemetery or Snowman have been expanded. There are also a lot of changes under the hood. Enemies will yield slightly more exp and the encounter rate has been readjusted. 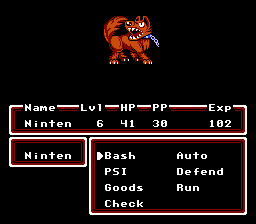 The “Dangerous Foe” battle theme is used less often and party members will be met at a higher level. DragonDePlatino’s goal in creating this hack was to make Mother less challenging, but still quite difficult. 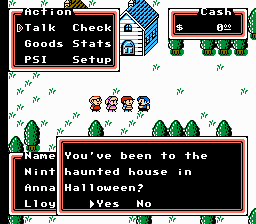 And last but not least, this hack uses Tomato’s official Mother 1 + 2 translation, adapted for the NES. Over 1400 lines of text have been altered to create connections with the rest of the series, improve clarity and shorten reading time. This hack will also feature much quicker battle text courtesy of vince94. Battles progress almost twice as quickly! Finally revising this review as I put my money where my mouth is and addressed both minor gripes I had about the patch with my own patches. This patch, while not guaranteed to satisfy everyone with 100% of its changes, is a breath of fresh air for an obscure classic that serves as a fundamental foundation for patches geared towards giving players a definitive edition of MOTHER to play. 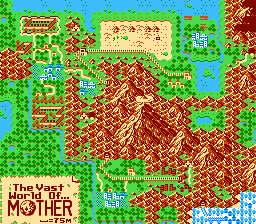 The redone overworld, map, and art assets look amazing, all lovingly redone by hand to recapture the initial designs of the game. The retranslation, like so many other retranslations of classic games that were restricted (seemingly) by space and (realistically) the infancy of localization, better captures the essence of the story Itoi wanted to share with everyone who played his game. The sprite rework, while admirable for all its effort, detracts from the soul and charm of the game, but there now exists a seamless patch to revert this. The streamlining of level-up text, while convenient, also removes a minor playstyle option for min-maxers such as myself, but there also exists now a patch to rectify this. Really, there are a great variety of optional patches that are compatible with this one or the fork (exclusive alternative patch), that any shortcomings are negligible. Above all else though, this patch reignited my passion in reverse-engineering and coding for hobby, and for that Dragon and all who helped you on this project, I thank you.